A simple to make gas collector. I have constructed this simple gas collector. It consists of two lengths of storm water pipe of differing diameters both with end caps to which are inserted brass pipe outlet fitting as per diagrams. 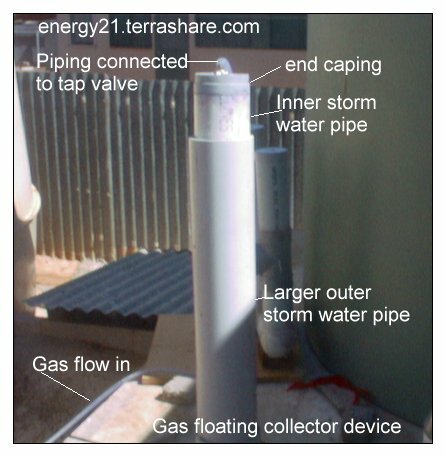 The bottom larger pipe has two brass pipe fittings inserted into the end cap ,one connection will be connected to the gas inlet via plastic tubing from the gas generator,the other will be for a water return to the gas producing unit. Please note whilst I believed the brass fittings were inserted tighly enough into end caps in previous constructions,I have found it would keep a liquid in ,but when gas became involved they leaked, so when the electrical connections and brass hose fitting where put into place, I have now also placed a layer of fibre glass resin on the in side of the end caps to make an air tight seal, and then leave it to cure overnight. This now seems to do the trick. I have also done this to a new gas generator unit I have just constructed as well, I found also with my orignal unit gas producing unit,the circular plates shorted out, so if and when you are constructing the gas generator as described ,make sure the stainless steel plates are not shorted out when constructing unit ,prior to sealing, I have found various sizes of plastic tubing pushed between the plates will surfice for this requirement. Just before sealing and when the fibre glass has been set (usually leave overnight) pour some caustic soda ) lye in to the generator casing and then seal with PVC glue. How to make the gas storage work. Connect up as shown in diagram. You will need to leave you gas pipe outlet tube unconnected for the moment,(That is, if your gas generator has been left empty,) but also held upright in a position, where water from the storage unit will not leak out while water filling is beening carried out..
Also make sure one piece of tubing is connected to the gas unit and then begin to start pouring water into the larger upright collection unit, until water flow starts coming out of the free exposed connection at gas generator. When this happens then quickly place the free piece of plastic tube from the gas collector and secure into place on the gas generator, so that water can now flow in a circular direction from gas generator to gas collection and back again. Place the gas generator unit on a angle as shown in the diagram, so that the gas produced will be collect on side of generator inner casing and then flow up the plastic tube to gas collector, and water will be able to return flow to the gas generator. Try to keep your gas supply tubing as short and as high as possible to aid with gas flow and water circulation,while keeping the water supply tube as low as possible. Place the other smaller diameter of storm water pipe, with the tap connected,into the larger pipe now filled water, and making sure the tap is turned on, so that air will be pushed out, when the pipe sinks to bottom,and then making sure this piece of sunken pipe is now completely covered with water and then its time to turn the tap off. Connect up your power supply to terminals and after a few minutes you should see bubbles of gas coming through one of your plastic tubes into the gas collection unit. If you keep watching the inner storm water tube, it will raise itself up, as the gas replaces the water previously postioned at top of tube. This is only a model of a device,but I see no reason why the idea could not be scaled up for more pratical purposes.